Yes, i yet live. Haven't done much other than sleep since clearing up the lung infection. But fortunately, most of the above mentioned Stick Figure Theatre: Adventures Of -3- was already completed before going into the hospital. So Wednesday, 1 June, not only will we resume our normal broadcast, but SFT:AO3 kicks off as well. 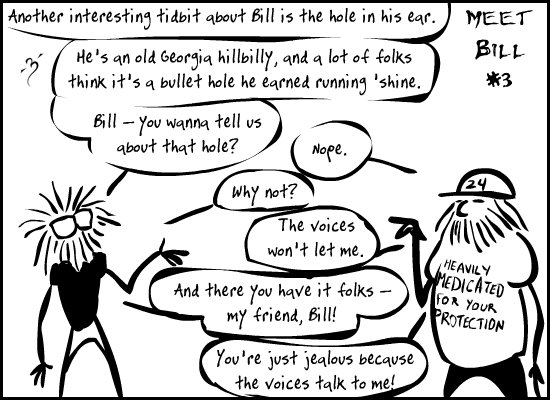 This will be a daily comic about me, the people in my life, and some looks at how experiMental Theatre gets created. Learn secrets and gain knowledge to provide "Ah-Ha!" moments later while reading eMT. And hell - i might even use color if i get to feeling ambitious. SFT:AO3 will run for at least the month of June, and then for as long as i feel it's still worth doing, not just trying to fill a space every day. And where will this strip be appearing? This is the part were i kick MO's besotted behind in such a hideous way next month. 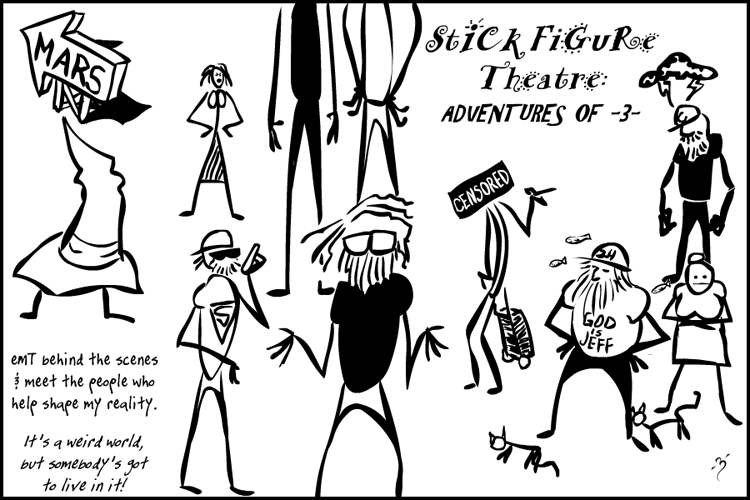 Stick Figure Theatre: Adventures Of -3- will be appearing on Top Web Comics, viewable only when you vote for experiMental Theatre that day. It updates at midnight, Pacific time (GMT-8) or as determined by TWC's server. A new comic every day, but only for that day - then it's gone when the new one appears. And, yes - that's MO up in the preview promo. Once some foolish innocent reads through her archives, she's an undeniable part of him ever after. Um.... did you mean the comic or the evil plan? I'm off to seek my bed while there be bed to seek. Just as long as I'm not the one with the beard. Actually I've been thinking of doing some more stick-women tales, just to bug the alliance. Unk - I'm loving the evil genius feel of it. MO - I missed the final score, but you were definitely in the lead at the end. This month, of course, i shall crush you. (Oh, and look!